Over the years, Hollywood has seen some truly abysmal remakes of classics, or franchise revivals, overcompensating for a lack of depth and plot with an excessive use of CGI and over-the-top sound effects. 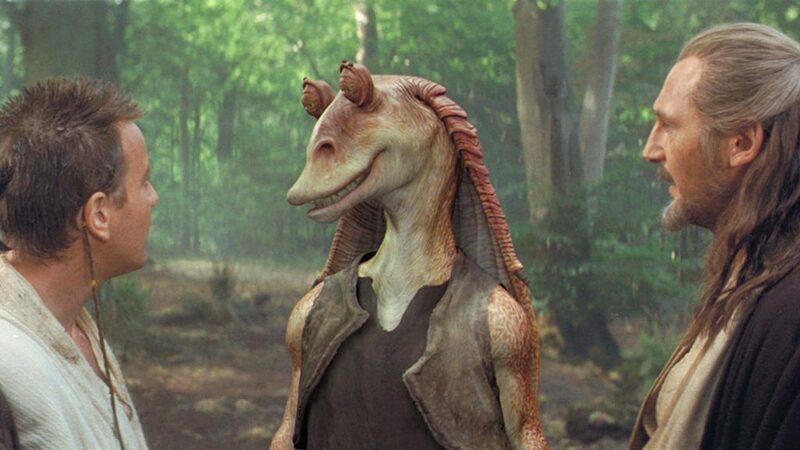 Think Star Wars, and Jar Jar Binks’ horrible nasal voice cuts right through the brilliant talents of Liam Neeson and Ewan McGregor or maybe how trashy Jurassic Park III was in comparison to the first one. Fast forward to 2014, and mere months preceding the release of Dawn of the Planet of the Apes, there was Godzilla: a stark example of a storyline (or lack thereof) jam-packed with non-stop chaotic action, soldiers running hither and thither yelling over epic background music, using complex military jargon in a bid to bring down amonster obscured by darkness in a visually aesthetic, but acutely empty saga that left plenty of viewers with the feeling of incredible dissatisfaction. In short: all style, and absolutely no substance. 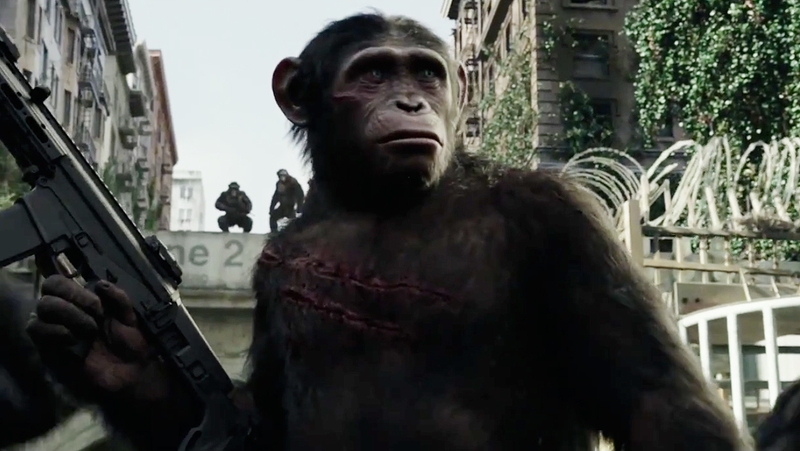 Dawn of the Planet of the Apes, on the other hand, was the larger-than-life, stirring sequel to its noteworthy predecessor Rise of the Planet of the Apes. 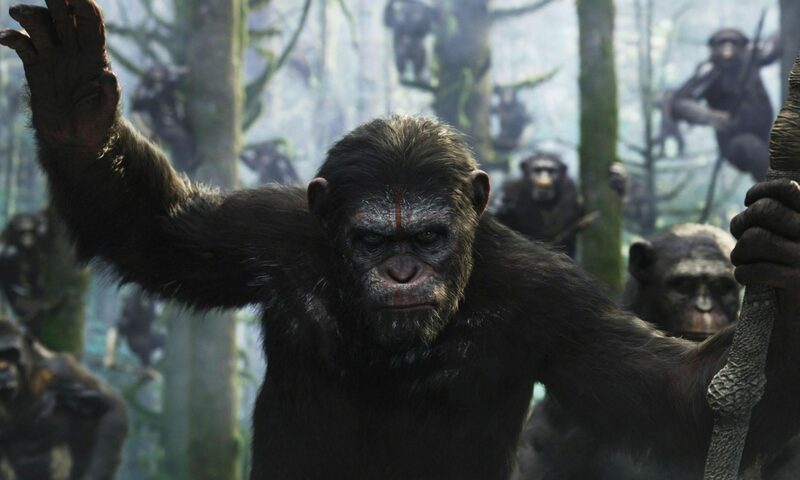 The story picks up on the heart-wrenching trail of Caesar’s decision to walk away from the species that raised him and lead the front lines of his own native ape army. 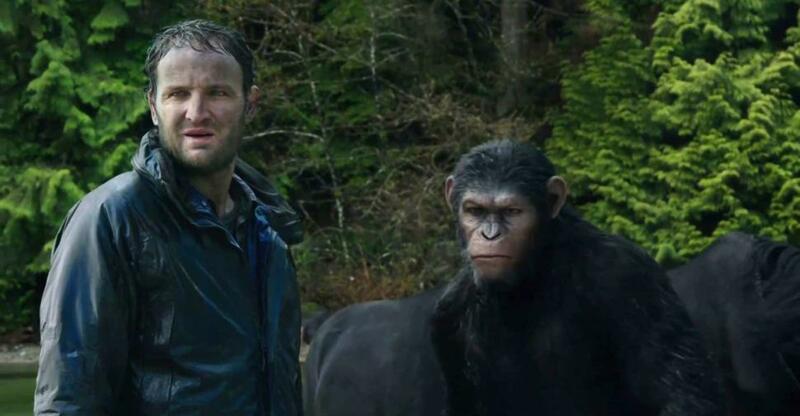 Set a decade after the first film, the ALZ-113 virus spreads, giving rise to the evolution of apes, who have set up base in the woods and bred under Caesar’s leadership. On the flip side, the human race has been watered down to bare bones, with many having perished under the influence of the ape-amplifying virus. 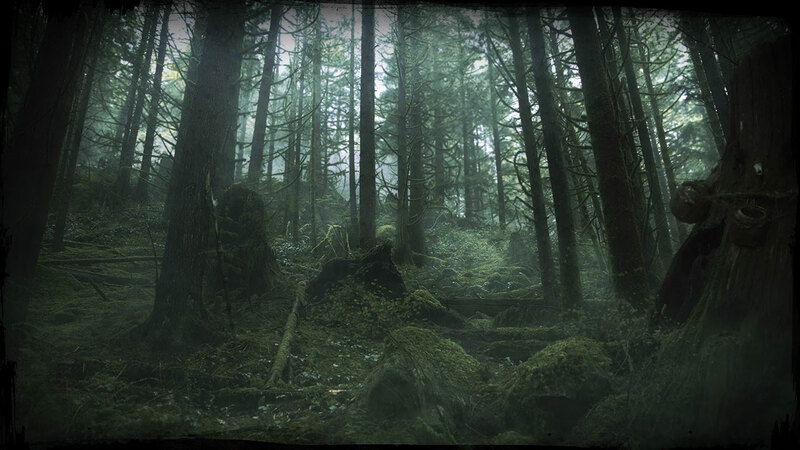 The few humans that are left are forced to confront the harshest of conditions if there is any chance to move the human race into the next era, and when their quest for survival infringes upon ape territory, the flames of disarray are fanned and war is imminent. This review will not delve into specific plot details that serve as “spoilers,” but will instead focus on the masterful techniques behind the making of a soulful film that left both casual moviegoers and critics alike contemplating the existential boundaries between man (and woman) and ape. 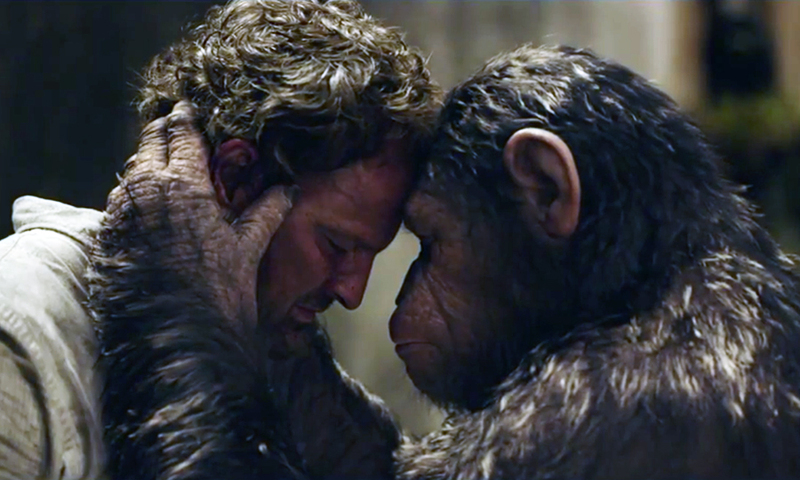 The review will also explore the essential themes that we have all reflected on at some point or the other in our lives and that were emphasized upon, albeit in a not-in-your-face kind of way, in Dawn of the Planet of the Apes. 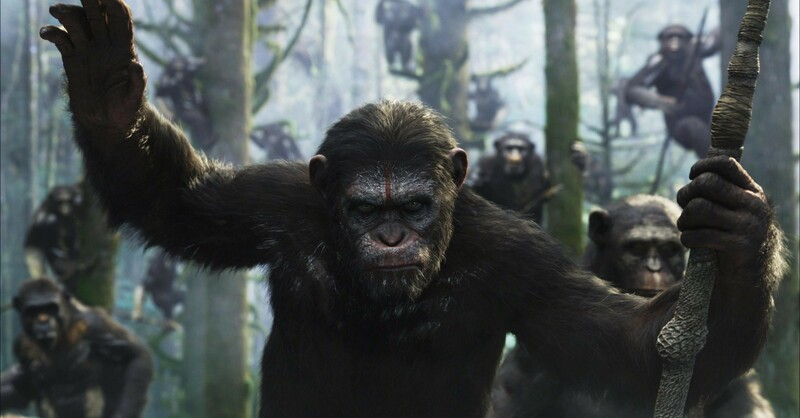 Mark Bomback, Rick Jaffa and Amanda Silver pulled all the right stops for Dawn of the Planet of the Apes, when their combined efforts resulted in a sublime, incredibly well structured script. The first two acts served as perfect building blocks to the action-packed final act and were filled with palpable tension, as the conflict between humans and apes, escalated gradually throughout acts one and two. The writers were careful not to lose the audience’s interest, with short bursts of strategically placed skirmishes that kept most on the edge of their seats, and kept them guessing what was to come next. The inter-species conflicts also served as intelligent subplots that really came together in a grandstand finale that was the third act. The script was set like a classical music piece, working its way in a steady crescendo, leading to what felt like a deeply fulfilling climax, while hitting all the right notes along the way. 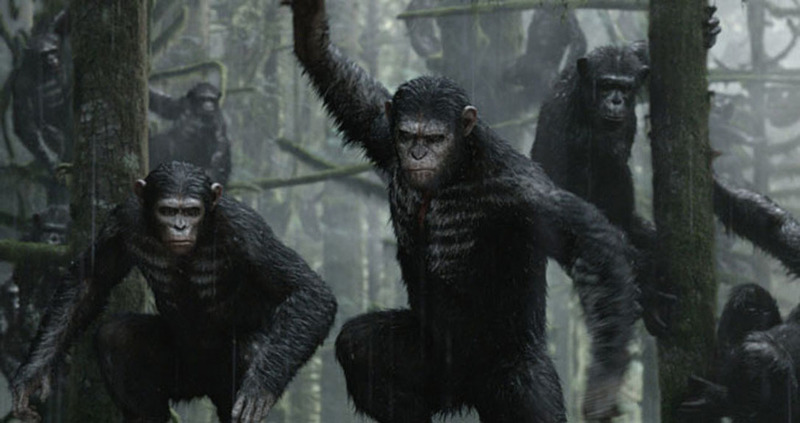 Dawn of the Planet of the Apes has to be credited for its immense production value that, in the words of Richard Attenborough, “spared no expense.” Shot against the backdrop of a gritty post-apocalyptic canvas, every bit of the estimated $170 million went towards intensifying the overall experience. The low-hanging cloud-cover, rising mist and frames depicting destruction and deprivation really gave off the impression of impending doom, and barrenness, which perfectly complimented the story line. 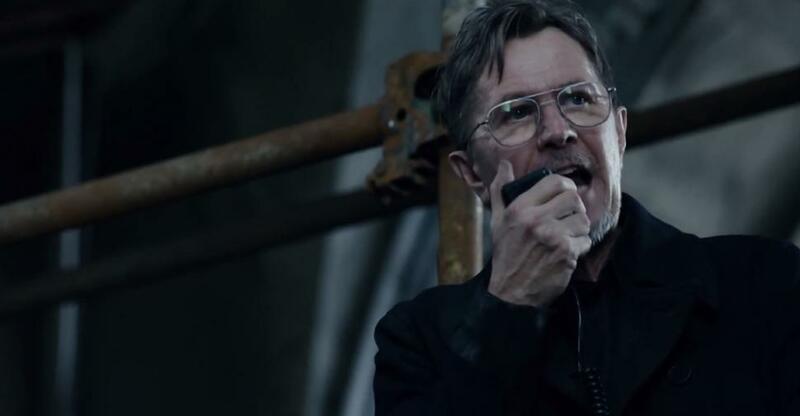 Where casting was concerned, it’s not like you’re gambling in a casino online when calling upon Gary Oldman to represent the antagonistic voice of the human front in a twisted tale of desolation. He held his own in his role as Dreyfus and delivered his part with conviction in a performance that everyone could expect from him. Toby Kebbell really came through with the sort of performance that drew contempt and spite the way King Joffrey did in the Game of Thrones. He depicted a cruel, fearsome and immoral ape that knew no bounds when it came to terrorizing members of both species. His scenes were the most shocking in the film, as he genuinely managed to strike fear in the hearts of the audience with horrifying acts of aggression, sometimes masked by a darkly comedic exterior that only further increased the shock factor. 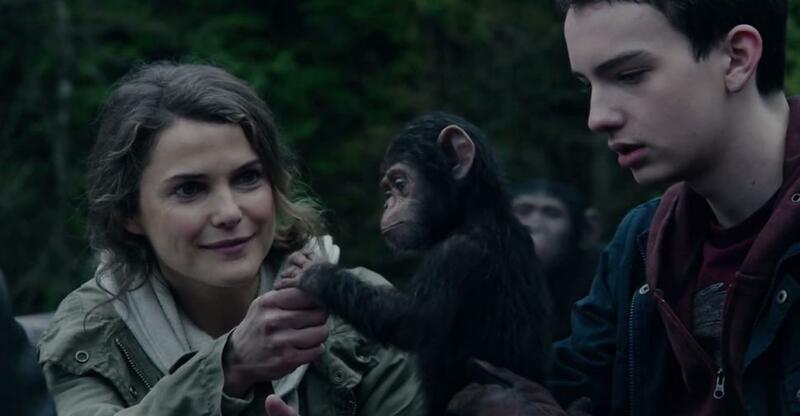 The rest of the cast that included a reliable Keri Russel, an up and coming Kodi Smit-McPhee and featuring Karin Konoval as the lovable orangutan, Maurice, did their part to ensure the film sailed smoothly. I’ve saved the best for last though. 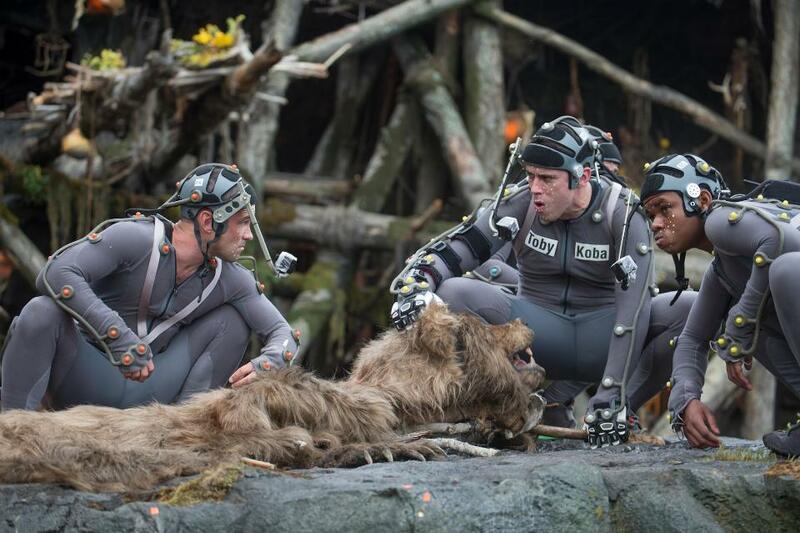 Andy Serkis really staked his claim as the king of motion-capture with a heartfelt, exceptionally moving and absurdly satisfying enactment of the film’s Ape-in-Charge, Caesar. 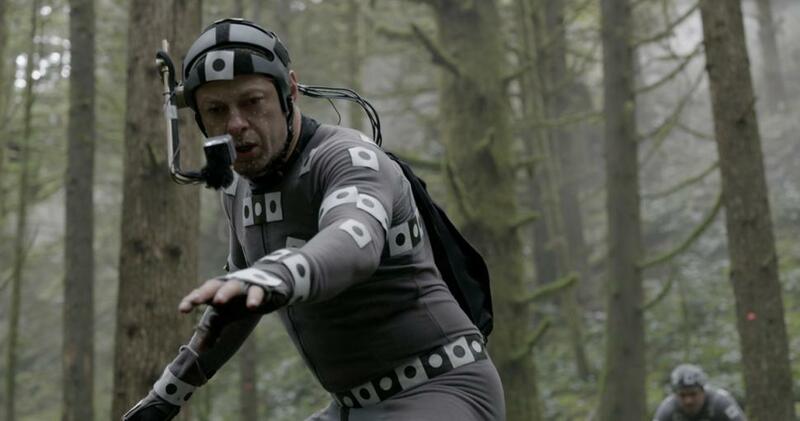 Serkis was largely responsible for the emotionally stimulating masterpiece that was Dawn of the Planet of the Apes. In spite of most of his dialogue being in sign, he still communicated the struggle in a clear and relatable way, and was impactful with the few spoken lines he was actually given. 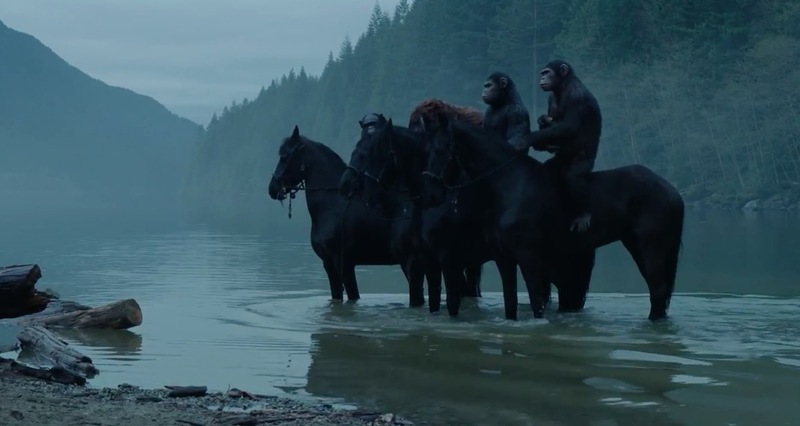 A real “hats off” to Andy Serkis for capturing the essence of Dawn of the Planet of the Apes and stepping up to the plate when it really mattered. A film can never truly be a complete and mesmerizing cinematic adventure without a fitting soundtrack. Composer Michael Giacchino orchestrated a fitting score that not only played orchestral strings, but also constantly plucked, pulled and stroked the heartstrings. He set the tempo for each scene and really contributed in the fabrication of a hopeless, genuinely conflicted and pain-ridden world that was aptly shot on camera by his namesake and genius Director of Photography, Michael Seresin. Called upon to pull the strings from the director’s seat, he succeeded in bringing it all together in a retrospective wave of collaborative brilliance. 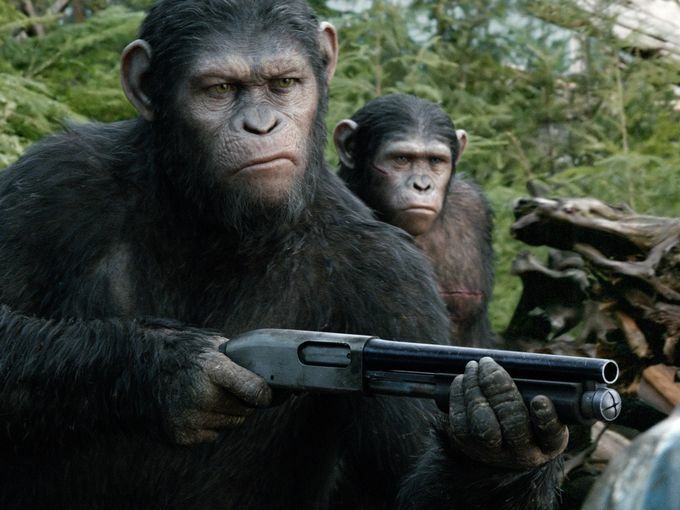 Granted he was given more to work with than Rupert Wyatt’s more limited Rise of the Planet of the Apes, nothing can be taken away from the expert direction that led to this sequel vastly outshining its counterpart. Coming back to CGI, it was deployed to perfection in this film. Many films are criticized for looking far too “digital” to be authentic, but you’ll get none of that in Dawn of the Planet of the Apes. Careful attention has been paid to each and every detail in each and every frame, such that within the first ten minutes of the film, you’ll actually forget that you’re watching digitized apes conjured in an animation studio with the help of motion-capture suits and actually feel as though you’re peeking through a grimy window into a horrifying reality that could well become your own someday if we’re not careful (that’s what you might be thinking throughout the movie). 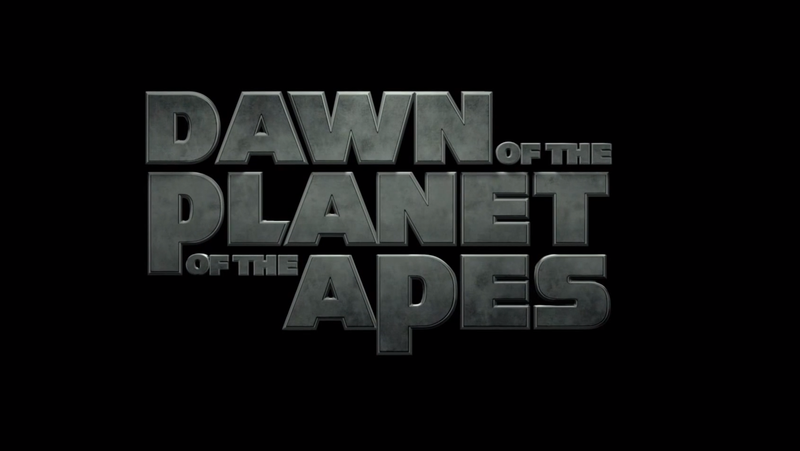 The film as a whole takes the Planet of the Apes to a completely new level. 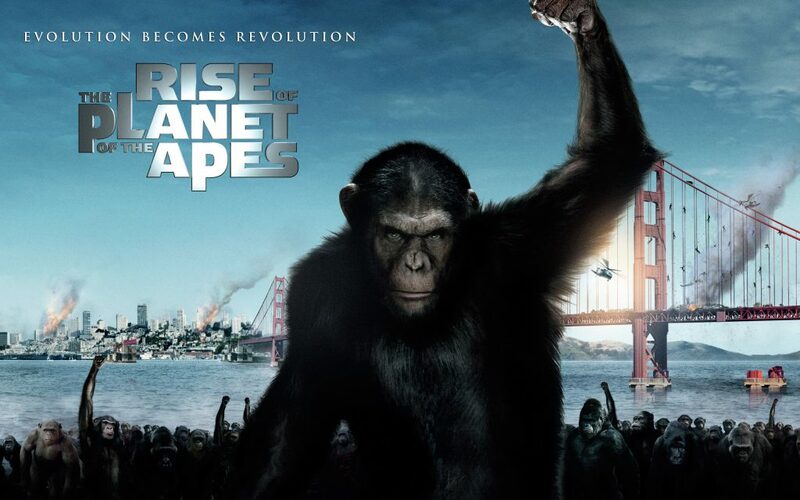 Whereas in the first one, we were merely introduced to scientific experiments conducted on apes as well as cute and humorous exchanges between Caesar and Will, Dawn of the Planet of the Apes takes us to the heart of the underlying issue that we all know, but speak little about. Set in an expansive universe, it draws upon themes of survival against the odds and leaves us questioning the state of our human affairs. It highlights the willingness to gamble (we don’t mean in an online casino) and impulsive nature of human beings to march straight into war without discerning individuals in the opposite camp. Generalizations spark debate and only widen the entrenched cleavages in our society’s fragmented understanding of how the world works. The apes are used as an effective tool with their primitive practices and lack of modern conduct that really give off the impression that we are no better off than our primal ancestors. The intra-specie relationships demonstrate how although humans and apes have their own methods of interaction, there is a common ground, made more obvious by the need to survive in adverse conditions where compassion is lost and instinct takes over. One of the most striking aspects of the film was the relationship between Caesar and Malcolm that showed friendship can push the boundaries of race, gender, creed and even species, albeit being marred by the efforts of the xenophobic majority whose discriminatory nature and reckless, unreasonable finger-pointing only serves to aggravate tensions and leap into action without logical perception. Naturally, where there is conflict there is betrayal and allegiance, and it was interesting to find it in both parties. Using the apes as a metaphor for our unsophisticated instincts when our existence is threatened was a masterstroke, and that, arguably, was what separated this film from other ape movies. Whereas Rise of the Planet of the Apes was a simpler, single-faceted, moving piece about humans experimenting with animals with a clear separation of the two species, Dawn of the Planet of the Apes was a multilayered art form that reconciled the basic nature of humans with that of their ape counterparts and, in a way, it was not merely a war between the two sides, but a metaphorical war within ourselves to overcome prejudice and unite fronts in a bid to make the world a better place. There was no clear “good versus bad” here, with shades of grey a plenty that would leave its mark on viewers. The film still retained the charm from the previous one, particularly with the beautiful friendship between Caesar and Maurice. It also hinted at nostalgia with a brief James Franco cameo, demonstrating just how far Caesar has come on his journey from Rise to Dawn. 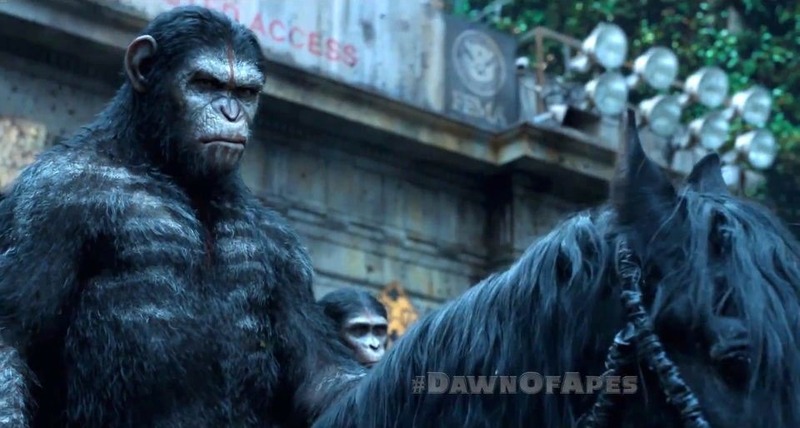 In summary, Dawn of the Planet of the Apes was not your average CGI-dominated, cheap Hollywood blockbuster, nor was it the typical money-grabbing sequel we have come to know from other franchises. It was a deliberate, carefully mapped out artistic fusion of cinematic brilliance, an all-encompassing, visually-appealing, nerve wracking, heart-tugging sequence boldly conducted by the proven combined talents of director Matt Reeves, a superb cast and crew who really made it look like they cared about the film. 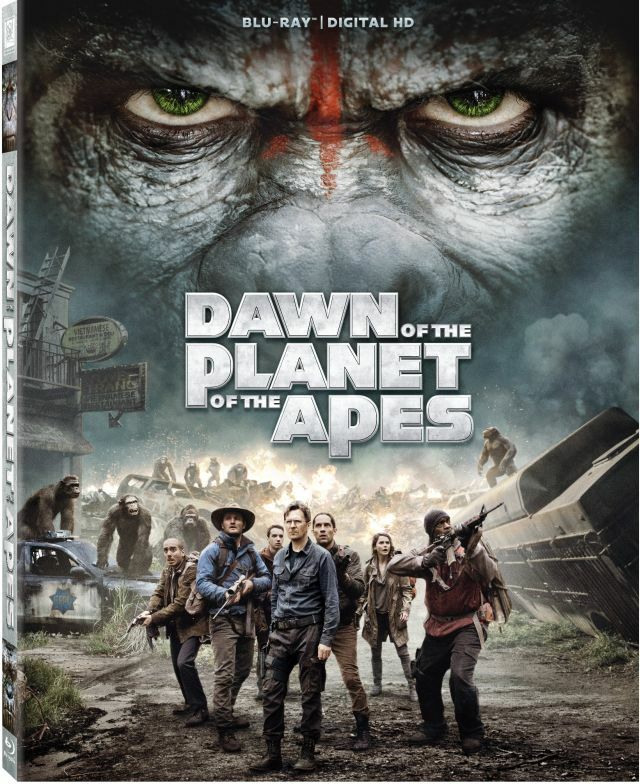 Rated PG-13 for intense violence and action and some language, there are certainly some scenes that would shock the jammies off an adult, let alone a youngling bouncing up and down excitedly as she gets to see her favorite apes in action. Make no mistake, Caesar has grown and has been robbed of his innocence as he is forced to step into some sturdy boots and take charge of a violent uprising in the making and it may not be wise to take your eager preteens in for this one. 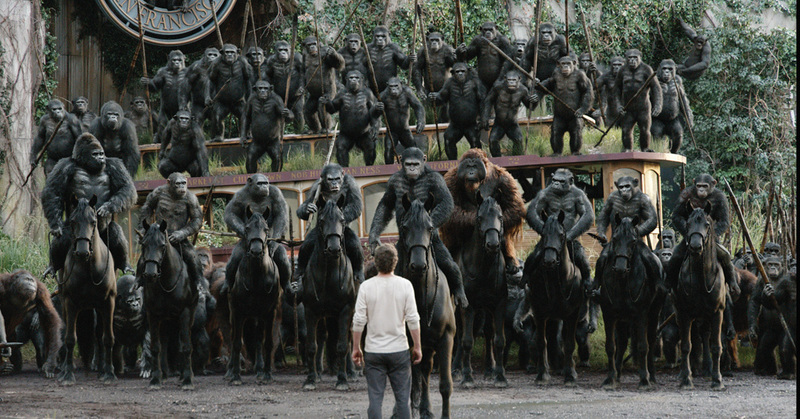 All in all, Dawn of the Planet of the Apes fully deserves to take away the plaudits for its breakthrough in the effective use of realistic CGI while keeping in balance with a profound storyline that left viewers a plenty feeling a rush of gratitude and hope for the cinematic universe in an era where monster-mashing, aimless blockbusters are racking up the millions in the box office. 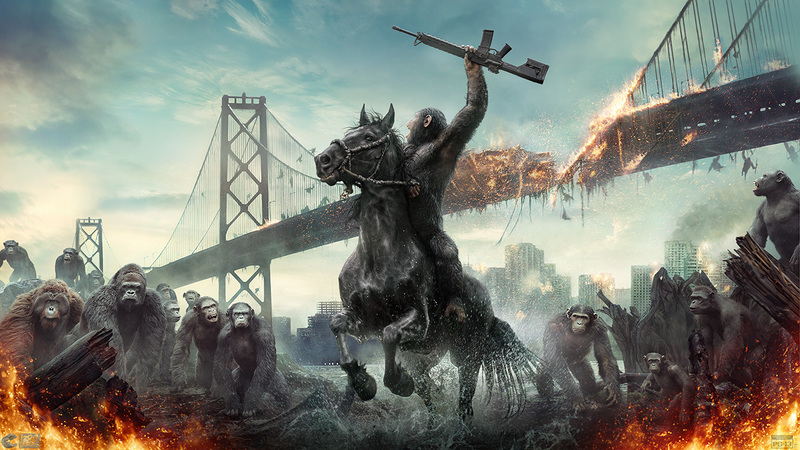 Dawn of the Planet of the Apes is without a doubt one of 2014’s best movies and arguably one of the best ape-centric films of all time. Definitely a must watch if you haven’t already seen it. 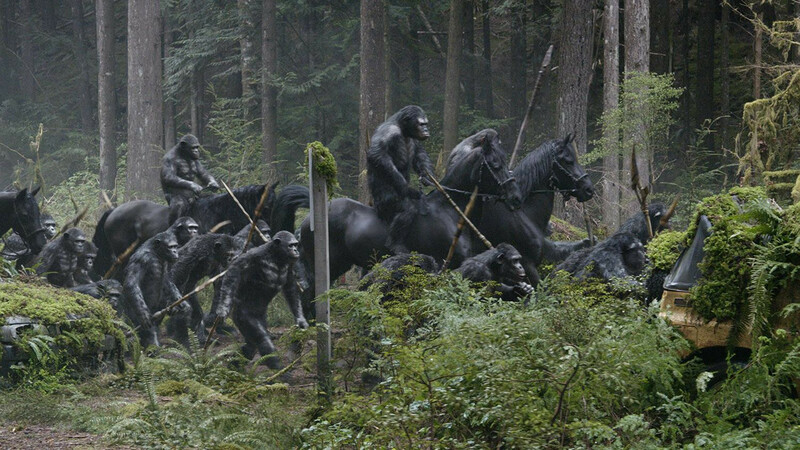 On this website we will cover everything to do with Dawn of the Planet of the Apes including images, trailers, facts and more.